2. 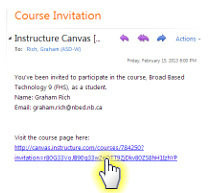 "Course Invitation" email - Click the link! Click the blue "Accept" button. Follow these instructions to get setup. Click to "Create My Account"
Please enter your school password. Set time zone: "Atlantic Time"
6. Click "Take Purchasing a Computer Quiz"